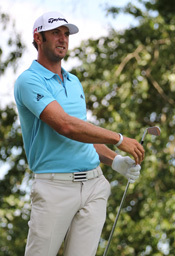 Coastal Carolina University alumnus Dustin Johnson, who held professional golf’s No. 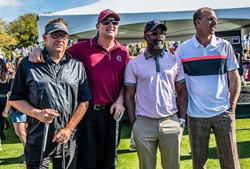 1 ranking for more than a year, and the band Hootie & the Blowfish, which holds an annual fundraising celebrity tournament and concert on the Grand Strand, are being honored this year. All four band members and Johnson have vowed to be in attendance for the induction ceremony on Feb. 27 in the Myrtle Beach Golf Hall of Fame Garden behind the Pine Lakes Country Club clubhouse. Johnson is perhaps CCU’s most famous alumnus and maintained a residence in Myrtle Beach for several years after four years at the Conway school from 2003-07. The Columbia native has won 19 PGA Tour events, including the 2016 U.S. Open and at least one event in each of his first 11 years on the tour entering this season. He has held the No. 1 spot in the Official World Golf Ranking for a total of 77 weeks, including 64 consecutive weeks in 2017-18, and has represented the United States in a combined seven Ryder Cup and Presidents Cup competitions. His PGA Tour earnings exceed $56 million. Hootie & the Blowfish has sold more than 25 million albums. 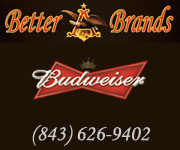 Prior to its mainstream success the Columbia-formed band’s members – lead singer Darius Rucker, guitarist Mark Bryan, bassist Dean Felber and drummer Jim Sonefeld – regularly played golf and shows on the Strand in the 1980s and early ’90s and returned in 2003 with its event. 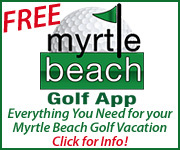 The Hootie & The Blowfish Monday After the Masters Celebrity Pro-Am will be played for the 25th time on April 15, and Myrtle Beach nabbed the event with a sponsorship, marketing and operations agreement after it was played in Columbia and Kiawah Island over its first eight years. It will be played at the Barefoot Resort Dye Club for the 17th consecutive year. 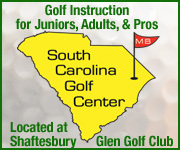 Proceeds benefit the Hootie & the Blowfish Foundation, which supports educational and junior golf charities in South Carolina. The tournament has annually raised between $200,000 and $500,000, according to organizers, and the success of the event on the Grand Strand has led to the creation of a $3 million endowment. 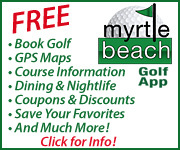 Existing members of the Myrtle Beach Golf Hall of Fame are: General James Hackler, Cecil Brandon, Clay Brittain, Carolyn Cudone, Jimmy D’Angelo, Robert White, George ‘Buster’ Bryan, Charlie Byers, Paul Himmelsbach, Gary Schaal, J. Egerton Burroughs, J.Bryan Floyd, Edward Jerdon, Casper Leon Benton, George Hilliard, Critt Gore, Russell ‘Doc’ Burgess, Sandy Miles, Phillip Goings, Edward Burroughs, Kelly Tilghman, Vernon Brake, Bob LeComte, Ed Bullock and Larry Leagans.